We woke up at 3:00 AM to get an early start on our final day of the John Muir Trail. Our initial plan was to wake up early enough to reach the summit for sunrise, but after the 25 mile day leading up to Guitar Lake, sleep and rest sounded a little better. We still wanted to catch sunrise from Trail Crest though, so we did our best to have everything packed up and ready to go by 4. As I sat in the cold darkness eating my oats, the excitement of the finish line began to flutter my stomach. We had hiked more than 200 miles in two weeks time, and this was the end of the journey. As I looked up towards the trail, I could see a procession of headlamps leading towards Trail Crest in the dark like a line of ants. There were also isolated headlamps flickering all about Guitar Lake, as other hikers readied themselves for a day at the summit of Mt. Whitney. The sky above me was crystal clear, and the stars beamed bright with the promise of perfect weather. The first stretch of the John Muir Trail wraps around the eastern shore of Guitar Lake and crosses a few streams before it begins to climb. It was hard to gauge the depth the water in some areas due to the night sky and the intensity of my headlamp. I played it safe here, going slow and making sure my footing was secure. After this stretch, the next few miles were a blur. We climbed a long series of switchbacks, gaining elevation with each pass. It wasn’t long before we saw a pile of backpacks left by other hikers at the Trail Crest junction, a strategy used to lighten the load on the final climb to 15,505 ft. We decided to keep our packs on, as they were light enough, and hiked north towards the summit of Mt. Whitney. The remaining section of trail that leads towards Mt. Whitney, is made up of the type of scenery you’d expect to find in a fantasy novel. There are towering granite needles that create living windows to the east. It was at this point that the sun was just starting to break over the horizon and spill the warmth of alpenglow on the surrounding peaks. The wind started to pick up as we gained elevation, and with every step upward the temperature continued to fall. We proceeded hiking towards the summit, and made the final push on the broken field of talus before the Mt. Whitney Hut came into view. It was incredible to be standing on the highest point in the lower 48 states at sunrise without a cloud in the sky. We reached the summit of Mt. Whitney last year on a day hike, but the views were obstructed by a thunderstorm. It was incredible to be at the summit on this day with nothing but clear skies in view. We took off our packs, and layered up to brave the cold winds at the summit before walking around to take it all in. We had hiked more than 200 miles, endured the heat, thunderstorms, rain, and trail life for two weeks, and no part of me wanted it to end. There is something incredible about being able to just wake up and walk each day. To see new land and be nomadic. As I looked out from the summit of Mt. Whitey, the familiar feeling of belonging washed over me once more. We go out into the wilderness looking for an adventure, and so often we find ourselves and so much more. The downhill hike from the summit to Whitney Portal was a relaxing stroll, filled with words of encouragement for the day hikers braving the 99 switchbacks to Trail Crest. The weather was warm and perfect, and the sky was still free of clouds. We stopped at Lower Boy Scout Lake to filter some water, and then continued on towards the finish line. We reached Whitney Portal and took a moment to collect ourselves. This trip was an entire year in the making, and had been a dream for multiple years. All of the emotions that welled up inside of me at the summit of Whitney, turned into a zenned out state of bliss when I caught my first whiff of grilled meat at the Whitney Portal store. We made our way over, grabbed a few burgers, and relaxed on the patio for a well deserved lunch. There was nothing left to do, and nowhere left to go. We hitched a ride down to Lone Pine, hopped in our car, and made the drive back to civilization. 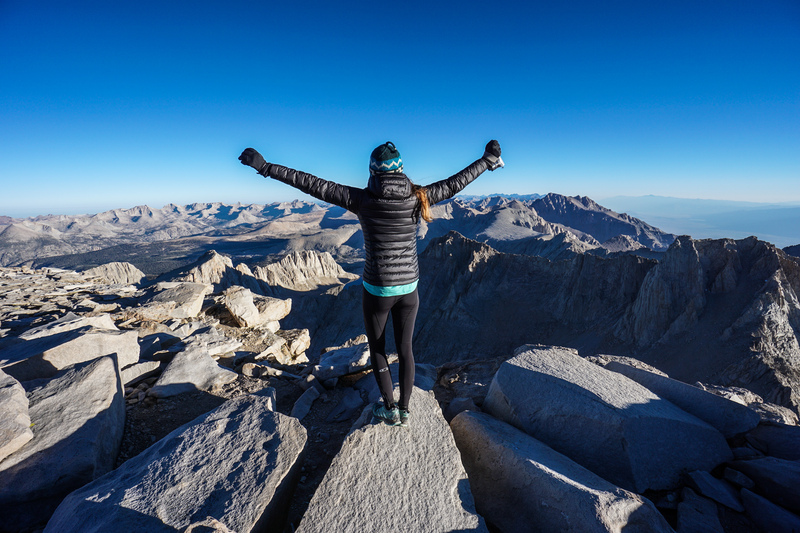 The John Muir Trail was complete, and I went back into the world a better man. Fantastic! Congrats on completing an incredible adventure! Gah! So beautiful and wonderful pictures! I cannot wait to hike through here on the PCT. Thanks! You’re going to love it. We met a lot of PCT hikers heading north, and almost all mentioned this was their favorite stretch of trail. As always, great post Drew! Thank, Anna! I used an Osprey Exos 58 that I loved. Julia used a Deuter ACT Lite 60, that she wasn’t so fond of. I saw a few ladies on the PCT using the Exos 58 and 48. Everyone seems to love the pack. It’s light, durable, and customization. I would take it with me again in a heartbeat. Cheers Drew. I think the osprey is the way to go. At least i can find it here in Perth to try it on etc. I was thinking of ula or gossamer gear, but scared to spend so much money on something i cant even try. Through my research the exos might be my best bet. Thanks! I think that’s a really good call. Fit is key. I was actually looking at the Gossamer Gear Mariposa and a few of the ULA packs. The GG had a great feel and was very light weight, but the shoulder straps are unisex. I have a wide neck and broad shoulders so the fit didn’t feel quite right when I put it on. Luckily, I was able to send it back for only 8 dollars shipping here in the states 🙂 I may have ordered the wrong size though, and wouldn’t be opposed to trying a different version some time down the road. The ULA packs were probably the most popular cottage industry brand on the JMT. I’ve never tried one on, but have heard a lot of really great things about them. In the end, I went with the Osprey, as it’s sold here at REI, which has the best return policy imaginable. That always seems to sway me. I like the peace of mind. You’ll probably die when you hear this, but I bought the Exos for 160 US! You might be able to save money bu planning a trip to the US and buying all of your gear here! You are killing me…. About $230 US here. Pfft… I have enough points for a free flight to LA. If i didnt have a kid I’d hop over to buy. Would be cheaper for me. What a joke! Congratulations to you both. What a wonderful journey to remember all your lives. It’s been a pleasure and inspiration to have a peek into your experience. Thank you, Shellie! It’s been an incredible experience to relive it one more time by writing these posts. I guess it’s time to start planning the next trip! Congratulations!! These are some of the best photos of Whitney I have seen. So wonderful you guys did this together! So where is your next destination?? I couldn’t imagine the switch mentally back into being in civilization after all those days. I have loved following your JMT memoir. What amazing language, imagery and adventure. Congrats on such an amazing accomplishment! “…And the feeling of belonging washed over me…” Is this not what we seek for when we go out into nature? Feel nature in us? to truly belong to something eternal? This journey is so captivating. Through your eyes, words and pictures we have shared in your experience. Thank you Drew for this and I’, looking forward to your next trip! Exactly! Nature provides so much.